Hurll Nu-Way offers a few tips on buying the right type of portable outdoor gas heaters for the home or any hospitality venue application. Portable outdoor gas heaters are available in myriad options in terms of size, function, feature, installation, output and coverage among many others. Hurll Nu-Way’s advice will help prospective buyers get the best value for money, whether the purpose is to heat a cafe or restaurant’s outdoor area or the patio in the backyard of the home. 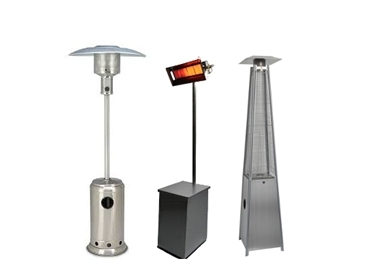 Portable outdoor gas heaters include floor standing mushroom style gas heaters; pyramid flame glass gas heaters; and ceramic infrared gas heaters. Considered one of the most inexpensive choices, mushroom style gas heaters offer a 40 Mj/hr output, which means a 9kg cylinder available at $20 per swap bottle will be used up in 11 hours, lasting 2 -3 days. Given that a considerable amount of heat will be lost through the top of the metal reflector cover, a lot of money will be wasted on gas consumption. There are several downsides to this type of heater. Though the average heating coverage is 9 – 17 square metres, one has to sit close to the heater to feel the comfort; it also takes up to two minutes to turn the heater on. Top of the range heaters are heavy and extremely hard to move around, while cheaper options are too light and unstable, which can create safety concerns. Many models in this low-end heater range offer only a 3-month warranty for commercial use. Total cost of ownership (based on average price and 200 hours of consumption per season for 5 years’ operation): $2200. Pyramid flame glass gas heaters are high on aesthetics as well as function and can heat up to a diameter of 6 metres or 16-30 square metres depending on the model. With a heat output on average of 36 – 42 Mj/hr and the possibility to run on high or low, top of the range models will use up one bottle in 10 hours. Though easier to switch on, these heaters are all about the appearance with more flames and looks than heat. One needs to be seated close to the heater to feel the warmth. Pyramid gas heaters also take up a lot of floor space, reducing the space available for tables in a venue, which means the revenue is impacted for the owner. Additionally, larger venues will need more heating units to have sufficient warmth all around. Pyramid gas heaters available in Australia are manufactured in China. Total cost of ownership for 5 years of operation is estimated at $3000. Ceramic gas heaters or infrared heaters heat the objects, not wasting energy on heating the air. Available in a price range of $500 - $1200, ceramic gas heaters are considered affordable. Running in a capacity range of 16 Mj/h (on low) to 24 Mj/h (set on high), a 9kg gas bottle will power the heater for 20 – 30 hours. Heating a patio for about 100 hours per season would cost the homeowner $70-$100 in gas consumption. Key advantages of ceramic gas heaters also include quick switch-on and switch-off; side spread heat pattern eliminating the need to sit next to it for warmth; coverage of 25 - 40 m² based on the model; and high heating efficiency reducing the number of units required to heat up the space, resulting in saving floor space and requiring lower investment per square metre. Manufactured in France, ceramic gas heaters are available in Australia, with the heater operating on average for 20 years and requiring little or no maintenance. Total cost of ownership (based on average price and 200 hours of consumption for 5 years of operation): $1800.